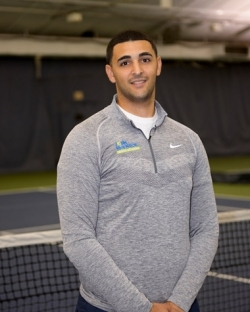 At this year’s annual USTA Long Island Region Awards Dinner, Sportime’s Jared El Gayeh was presented with the 10-and-Under Tennis Award which is given to the region’s top coach for U10 programming. That modesty is one of the many things that has made El Gayeh such a revered figure at Sportime. He began working at Sportime when he was just 14-years-old, and through the years, he has coached hundreds of young athletes in a variety of team sports, including soccer, basketball, hockey and more. He now brings his incredible energy to Sportime Syosset’s U10 tennis program. While working at Sportime, he began to do lots of training with Mike Barrell, who is known as one of the pioneers and gurus of U10 tennis programming, learning how to conduct drills and group lessons. Combining that extensive training with his personality and desire to work with kids made heading up the U10 program at Sportime Syosset a perfect fit. One of the main catalysts of the U10 program across the Sportime locations is its World Tour event series, which has added a new element and provided the kids with something to look forward to. El Gayeh has been a part of the Sportime family since he was a young teenager and has climbed his way up the ladder to become one of its key members. Since he took over, the U10 program has increased from 200 kids to about 350 kids, and is still growing.